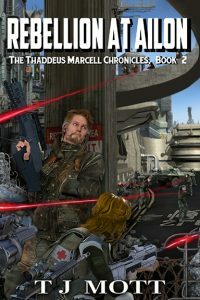 Book 2 of the Thaddeus Marcell Chronicles has been released and the ebook edition is on sale for $0.99 (normally $2.99) February 1st through the 8th! Mercenary leader Thaddeus Marcell decides to take some time off from his organization to heal and reflect. Using a false name, he heads to an enslaved world called Ailon, where he quietly volunteers with a medical charity while contemplating his violent history as a mercenary and what he should do with his future.